Henry Burges is a clockmaker you will not find much about in the reference books - principally because we know precious little about him. A few examples of his work are known, and he normally signs them enigmatically 'Henry Burges' or 'Henry Burges fecit' , leaving us no clue as to where he worked. A longcase clock by him is recorded in Britten's book, said to be in Australia at the time the book was compiled - perhaps a hundred years ago. I had a primitive thirty-hour longcase by him some years ago, a nine-inch single-hander with a finely-finished but conventional plated movement, signed just 'Henry Burges', and in the most charming and eccentric original oak case. I also owned a lantern clock by him some years back, again signed simply 'Henry Burges', originally made with a verge escapement but converted later to anchor escapement to improve timekeeping, as they almost always were. At the time of such conversion it was normal to remove alarmwork, if the clock had it, which this one did. That was because the alarmwork was usually hanging in the way of the long pendulum, so that you could not fit the one without removing the other. This particular clock is interesting too in so far as the maker's name is engraved in the dial centre in a blank zone which would have been covered by the alarm disc when the clock was first sold. This means it was either sold nameless or with the name of some other retailer for whom Burges made the clock. There were reasons why Henry Burges may have wanted his name to be concealed. These reasons are explained below but principally are because he was not allowed to trade in local market towns, nor to sell in the markets there, as he was not a freeman of the local guild. This engraved name would only have become visible, as it now is, when the alarm disc was removed. I know of three other lantern clocks by him which I failed to own. One sold at Sothebys auction in London in 1974 signed 'Henry Burges Fecit', believed to have been a balance wheel example. Another sold at Christies auction in London in 1979, also an anchor conversion, this one signed 'Henry Burges Fecit'. A fourth one sold at auction in Northern England in 2002, another anchor conversion. 1. Dial of the Henry Burges hybrid clock, 6.5 inches square and having a purpose-made fret riveted above in the manner of a lantern clock. Date maybe 1690. Click for closer view. 2. Movement of the Henry Burges hybrid clock from the left. The plates and pillars are of iron. Click for closer view. This was the sum of our knowledge of the work of this little-known clockmaker, until the extraordinary clock came to light which is pictured here, a sort of hybrid clock half-way between lantern and longcase and unlike any clock I ever came across before. This unique clock is signed, like most of his others, simply 'Henry Burges'. The clocks themselves give little hint as to who he was or where he worked. But using a few clues I think we can make a reasonable guess. The longcase clock I owned came from Oldham in central Lancashire where it had been privately owned for generations. The lantern clock I owned came from Liverpool. The newly-discovered hybrid longcase clock came from Macclesfield, believed also to have been in the same family's possession for many years. Those known places of origin point to the Lancashire/Cheshire area. We don't know where the clocks came from which went through the London rooms, but the bigger auction houses typically sell their better items in their London rooms, regardless of where in the country they originate. There were clockmakers named Burges (usually spelled that way) in north-west England, in particular in Wigan, where clockmaker John Burges was married in October 1711. His application to become a 'freeman' of Wigan (which would have given him the right to set up shop there) was rejected in 1711, when he was termed a 'foreigner' - by which they meant not someone from overseas but someone not local to that town. John persisted and was eventually granted his requested freedom there in 1712, as a gunsmith. In 1713 he was described as a clockmaker, and it may simply have been that he craftily called himself a gunsmith in 1712 to increase his chances of freedom, as there were other clockmakers already trading in the town, who might well have seen his request to make clocks there as unwanted competition. The town guilds of those times were mostly groups of established traders, who banded together to keep out unwanted competition. Of course it must have been common knowledge that at that time almost all metalworkers who made clocks also made guns as well as many other metal items, and John Burges got into the trade in Wigan by the back door, if not by concealing then, at least by camouflaging his real profession. I know of three very fine eight-day clocks by John Burges of Wigan, one of which I once owned, and another one bearing the date 1741. Some of his earlier clocks are signed John Burges 'de Wigan' as was the custom of the day. John Burges died in 1754. Thomas Bridge who worked in Wigan from the same time as John Burges signed in the same way, 'de Wigan', as did Henry Hindley a few years later. Thomas Bridge was granted freedom there in 1712, the very same year as John Burges, having stated in his application that he was apprentice-trained and rarely made a clock with a duration of less than ten days. Perhaps he made a particular point of stipulating that, knowing that John Burges (son of a local maker of mere thirty-hour clocks and who was probably not apprentice-trained) had already been turned down once. The clocks of Henry Burges, at least those we know so far by him, both lantern and longcase, are all of thirty-hour duration, the simplest and cheapest types possible. This is consistent with what we would expect of Henry's period, a generation earlier than Thomas Bridge or John Burges, for in Henry's day clockmaking was in its infancy in the provinces and makers were struggling to sell even the most modest of clocks. The sons of such early makers grew up to become second generation workers in the trade and could set their sights higher. John Burges and Thomas Bridge were such second generation makers. Bridge's ten-day clocks are a bit of an exaggeration. Virtually any eight-day clocks set in a tall enough case, will run for ten days, and Thomas Bridge's clocks, fine though they are, are simply that. But the Wigan guild masters, unaccustomed to such things at this early period, might well have been open to having the wool pulled over their eyes. What they would know was that John's father, Henry, was a maker of common thirty-hour clocks, not 'ten-day' ones. Recently a correspondent sent me photographs of a longcase clock of about 1750 signed 'Joseph Burges, Wigan'. This was a maker previously undocumented and appears to have been the son of John. I found his baptism at Wigan in 1727. By the time Joseph made clocks, the custom of using 'de' has fallen from use. The point about John Burges is that he was the only early clockmaker in the area with that surname - normally spelled with one s, but spelling is often unreliable in those days, and a lot depended who wrote the word down. I found that he had a child named Henry baptised at Wigan in 1712. I knew from the clocks I had seen by Henry Burges that he was working in the 1680s give or take a little. It seemed quite possible that Henry might have been the father of John, with Henry junior (born 1712) named after his grandfather. John also had a son of the same name, but he died young. Searches failed to trace the baptism at Wigan of any children to Henry, but I did locate a Henry Burges who married in Wigan in 1665 to Mary Roberts, and this must surely be the clockmaker. 3. Movement of the Henry Burges hybrid clock from the right, showing the amazing hammer-counter spring shaped like a tulip. Click for closer view. 4. View of the Henry Burges movement from the back to show the lantern type cross bars to hold the wheelwork, the hammer positioned on the right (as seen from the front that is), the lantern-clock-style frets seen from behind, and the bell with normal bellstand in the manner of a longcase. Click for closer view. The implication is that Henry Burges worked near, but not in, Wigan. We know he was not a freeman of Wigan - if he had been he would have stated so on his clock dials, and would not have needed to sell clocks with a hidden signature, like the lantern clock pictured here. Further more his son, John, would have had automatic right to become a freeman there (by the right of his father's freedom, known as 'patrimony') and could not have been turned down by the guild. Signing without a placename is often characteristic of clockmakers working at this period in a rural hamlet or village. We may one day find out more about Henry Burges and his place of work, but for now we have to be content to know him through his clocks. His work, as we have already seen, is characteristic of a rural clocksmith, as they were then termed, a metal worker who included clocks in his output, for these earliest provincial clockmakers tended to be jacks of all metal trades, most of their time being spent on repairing anything mechanical rather than on making things. Lantern clocks were very uncommon in the North of England at this time. This is because, when clocks were introduced here, the longcase was already an established form, and it did all that the lantern clock could do and did it more conveniently locked in a case, where the dogs and kids couldn't tug at it. We know Henry made both types, but the fact that he made lantern clocks at a time and place where they were already virtually regarded as obsolete, is significant to my mind in suggesting that he was making the cheapest possible form in order to make a sale. Lantern clocks were considerably cheaper than longcase ones, if only by the cost of the case. A generation later his son, John, did not need to do that, but Henry was selling to a generation who had always managed to pass their lives without the need for a clock. It is difficult to imagine a more sales-resistant group of people to try to sell a clock to than tight-fisted seventeenth-century Wiganites, who didn't need to know what time it was anyway! They used to say that such a task was like trying to sell fridges to Eskimos, but they don't say that any more. Henry's clocks had to be the cheapest it was possible to make. Which brings me to the most recently-discovered clock by Henry Burges, pictured here. This is a thirty-hour clock (of course) housed in a superbly primitive long case, the case reminiscent in some ways of his only other one known to me previously, but the construction of the clock itself is like no other clock I ever saw. 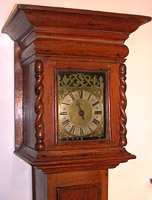 It is a posted-movement clock with four iron corner posts and iron top and bottom plates, clearly made to sit in a case, as it has no wall-hanging features such as the normal hoop and spikes a lantern clock would have. Its wheels are held by cross bars just like those in a lantern clock, as of course are all posted-movement wheels. Yet we know Burges used the plated form of construction for his thirty-hour clocks. He probably used the posted form with lantern cross bars because it was cheaper, even though it was a form of construction not loved by northern makers. But the dial is only six and a half inches wide, more the size of a square-dial lantern clock, yet its style is that of a longcase. The dial has tiny spandrels in the manner of a longcase dial. And yet it originally had side doors, which are found only on lantern clocks. The doors are now missing but the door-support holes remain. The clock also has pierced frets to the front and sides, a feature found only on lantern clocks. But these frets are not the normal pattern or size of lantern clocks frets, as this dial is too wide for the traditional ones. The frets must have been made purposely by Burges to make the clock more suitably fit the rectangular hood door. He has made them in the same general style as those lantern clock frets we call 'foliate' frets. The clock was built with anchor escapement and a long pendulum, beating roughly once a second, just like any other longcase clock of the day. Yet the lantern-clock movement has the hammer positioned on the right. A right-handed hammer in a lantern clock is usually an indicator of a clock that originally was built with a balance wheel escapement. The reasons for this are a bit technical but basically so that the two separate weights (one for going and one for striking) could hang at opposite sides of the clock to keep it level, as two weights on the same side would have caused it to slew round on its wall hook and come out of balance. Yet this clock by Henry Burges still has its original anchor escapement, and a right-hand hammer. This is explained by the fact that some lantern clocks, especially those built in Lancashire, had two separate weights, even when built with an anchor escapement. This can be seen on examination to have been the case with Henry Burges's clock. Though it now has a continuous rope and a single weight, it can be seen that it originally had a winding click on both main wheels, which means that originally it had two separate weights. The reason for this separate-weight-drive is not known but can be guessed at. Such an arrangement of two weights means that the owner can decide to have the clock striking or not by choosing to wind up the strike side, or leave it run down. No such option is open to the owner of a clock with a single weight and continuous rope, where the going and the striking sections are wound up in the single action. Henry Burges's clock was modified later for convenience to single weight drive with continuous rope, to achieve which all that was needed was for one ratchet to be riveted as a fixed wheel. The case is in fact a lantern clock case, of which very few are known from the seventeenth century. By very few, I mean probably barely more than a dozen in the published literature of horology. The clock dial with its top fret measures six and a half inches wide by nine inches high. The glass of the hood is seven inches wide by nine inches high. There is no opening hood door for access, but to adjust the hand you have to remove the hood - a feature of virtually all lantern clock cases and some early cases for longcase clocks (such as that in plate 5). The barleytwist pillars to the hood are interesting. Many early longcases have barleytwist (or barleysugar) pillars, which was a popular feature till about 1710. But the pillars on these very early lantern cases sometimes (as here) do not terminate in true capitals and bases, but stop short or 'hang' on the hood corners. There is no recognised term for these so we have to invent them, and I call these 'hanging' pillars. 5. The Henry Burges hybrid clock in its oak case, extraordinarily slender by virtue of its tiny dial. This is the type of case made to house a lantern clock. Click for closer view. 6. Detail of the hood of the Henry Burges hybrid clock, showing the fine 'hanging' barley-twist pillars, which on these very early clocks hang free rather than having the capitals and bases of later cases. Click for closer view. The case has a vertical slot cut into either side, at a point where the pendulum would otherwise bump against the case side. It is unlikely the clock was made this way, but the slots have been cut into the case at a later date to prevent the pendulum bumping. I did once see such slots described in a supposedly serious book on clocks as being cut there so that the clockmaker could deliver the clock across fields inaccessible to a cart by carrying the clock case on his back, and using these two hand holes to grasp it by. This is absolute nonsense. The reason for the slots, which we often see on slender longcases, is as follows. When the clock was newly made the clockmaker would have set up the escapement to give the clock an adequate swing, which left the pendulum bob short of tapping against the sides - tricky with a very narrow case but still possible. But over the years such a clock goes to the restorers every now and then for a clean and an overhaul, and restorers love to give a clock as wide a swing as they can, on the theory that a wide swing is a healthy swing! Restorers don't have the case. That stays behind with the owner. The restorer brings the clock back and sets it up in its case with a good healthy swing, which gradually gains impetus till the pendulum taps, sometimes heavily, against the case sides - after he has left of course. Sometimes the act of tapping will then reduce the swing back to normal till it builds up impetus again. This can drive an owner crazy, probably to the point where he is not thinking straight. Perhaps you call back the restorer, who perhaps reduces the swing, and sets the clock running again as he leaves, assuring you everything is fine. After he has gone, you think you hear a tapping, then listen again for it, and it has stopped. Then a few minutes later it does it again, and stops again as the bump reduces the impetus. The very act of tapping, stops it tapping, as the knock reduces the swing, temporarily of course, till it once more gains reach and taps again. Eventually the owner deduces the problem, grabs a saw and cuts a chunk out of the case sides - which of course cures it! I have even seen clock cases where the clock has leaned to one side, and therefore tapped on one side only. Rather than solve the problem by levelling the clock, owners have sometimes cut a hole in one side only, the side to which the case leaned! In all this is an exceptionally interesting, and probably unique, clock. I have never seen the like before nor do I expect to again. These eccentric clocks from the very beginnings of provincial clockmaking show an individuality of thought on the part of the maker at a time when such men thought for themselves rather than making clones of clocks made by other makers, more enslaved to convention.